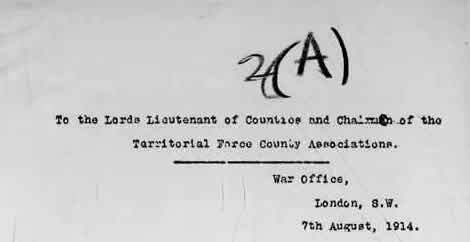 Letter from the war secretary, Lord Kitchener, to the county associations of the Territorial Force regarding the raising of a 'second army' of 100,000 men, 7 August 1914. 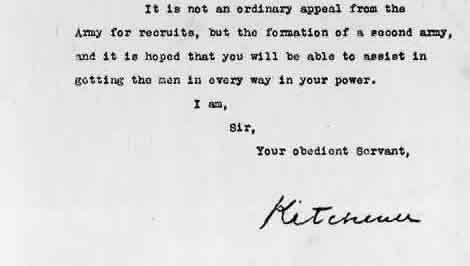 On the same day as this letter was issued, Kitchener also made a public appeal for 100,000 volunteers for the British army. Britain's most decorated living war hero, on the verge of retirement before the outbreak of war in August 1914, Kitchener played an integral part in the Asquith government's recruitment campaign, which reached a peak of success in late August and early September.